The Christmas season is a particularly difficult time for women to slow down and relish what's right in front of them. An annual marker for many, it is a holiday that can often remind us how life is not going as we'd planned. 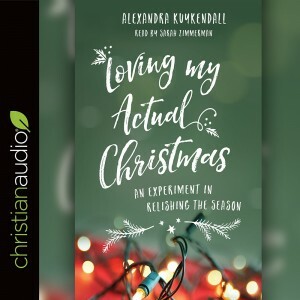 Our family relationships remain strained, our finances stretched, and our schedules stuffed with too much to do in too little time.Following the formula of her successful Loving My Actual Life, Alexandra Kuykendall shares with readers her own personal experiment to be completely present in her life as it is during the holiday season. Addressing the themes of Advent and Christmas, she reflects on hope, love, joy, peace, and relishing the season, with practical pullouts on common Christmas stressors, such as finances, schedules, and extended family. Kuykendall's signature candor helps women go easy on themselves, remember what truly matters, and find joy in their imperfect Christmases. "As Christians, we know we are called to love our neighbor. We may even grasp that 'neighbor' encompasses more than just the people living next door or down the street. But what we too often don't know is how to begin. How do we love our neighbor? Where do we start? What does this look like in our increasingly isolated world? Following practices outlined in the first chapter of 2 Peter, Alexandra Kuykendall lays out the framework for where to begin. 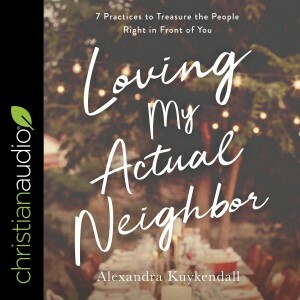 From practicing humility to listening with understanding to being generous in our relationships, Loving My Actual Neighbor offers practical, start-now steps listeners can take to love their neighbors. With her approachable, friendly tone and down-to-earth advice, Kuykendall has carved out for herself a place in the hearts of fans, who will be thrilled to extend her commonsense approach into this sphere of their lives."